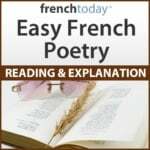 “Les Vous et Les Tu” is a sensual, yet very deep poem from Voltaire, 18th century. Particularly interesting for students is that it plays on the difference between Tu and Vous, since Voltaire says “tu” to the woman he loved, and “vous” to the one she became. Qui t’avait consacré sa vie ? Un sein d’albâtre, et de beaux yeux. Hélas ! qui n’eût été friponne ? Tu le fus, objet gracieux ! Tu sais que je t’en aimais mieux. Diffère de ces doux instants ! Ces enfants tremblent de paraître. Et se jouer dans ton taudis. Que tu donnais dans ta jeunesse. You will find the English translation of this poem in the Dual-Language Book presented here, as well as a short biography of the poet. I will be reading many poems (in the public domain) from this book.